The purpose of this award is to give annual special recognition to an AG Senior Civilian and Civilian Employee in military personnel management for contributions of outstanding significance to the Army and service to Soldiers. Eligible Civilian Employees include: GS, or NF, in career field CP50, those in CP32 who directly work developing or delivering HR institutional training, and CP51 or any other Civilian Career Program who directly work in support of military Human Resources support to Commanders, Soldiers and their Families. Eligible Civilian Employees must be assigned to the Department of Defense (e.g., MEPCOM), or the Department of the Army in support of the field of Human Resources Management. 1. The first category is the AG Civilian Employee of the Year and will include the grade levels of GS-01 through GS-09, or NF-1 through NF-3. 2. The second category is the AG Senior Civilian Employee of the Year and will include the grade levels of GS-10 through GS-15, or NF-4 through NF-6. If the nominee is a “retired military” AG Civilian Employee, the nominee must have a minimum of 10 years DoD and/or DA Civilian Employee service. If the nominee is “not” retired military, no minimum Civilian Employee service is required for career Civilian Employees, or Veteran Civilian Employees. The annual AG Corps Awards Program MOI provides all criteria for the John J. Dinnien Award for Excellence in Military Personnel Management. The MOI is distributed to major Army command headquarters and S1Net. Contact the AG School Operations Division, (803) 751-8300, if you need a copy of the MOI. Criteria within the MOI is summarized as follows: Completion of a task or assignment which has significantly contributed to the execution of the Army’s mission, while honoring all traditional American military values, placing special emphasis on: loyalty, duty, respect, selfless service, honor, integrity, and personal courage. The following evaluation criteria should be used in selecting Army Command nominees. Personnel assigned duties of major significance to the military personnel mission, which were accomplished in such a way as to have been clearly exceptional. Personnel who developed or improved military personnel methods and procedures, or were responsible for exceptional achievements that caused significant savings, or advanced the military personnel mission and personnel readiness. Personnel who provided outstanding examples for major military personnel programs in terms of highly successful mission accomplishment. Personnel who demonstrated a record of achievement and inspired others to improve the quantity and quality of their work. 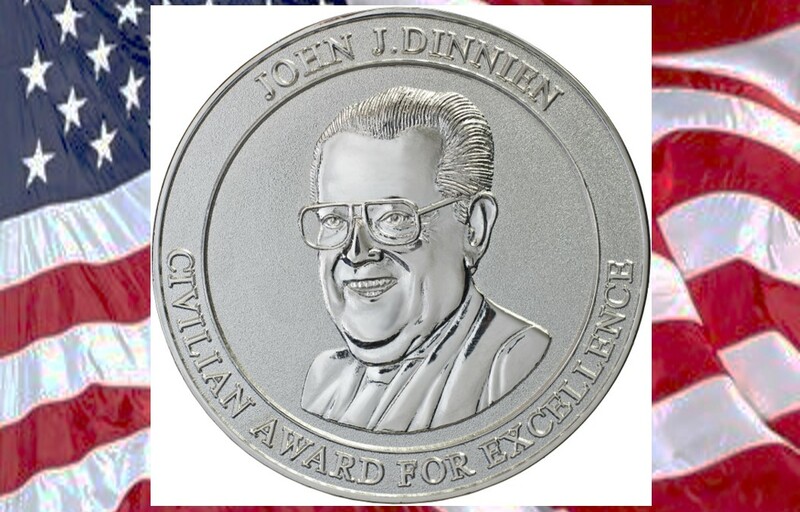 The “John J. Dinnien Civilian Award for Excellence” was created to recognize the contributions of DoD and Army Civilian Employees working and supporting military personnel management. The award is named in honor of Mr. John J. Dinnien, who epitomized the best qualities of a professional human resource manager, and always placed service to the Soldier above all else. To be borne by the Adjutant General’s Corps Regimental Association. Detailed recommending procedures and all criteria for the John J. Dinnien Civilian Award for Excellence are found in the annual AG Corps Awards Program MOI. The MOI is normally distributed to major Army command headquarters and S1Net on or about in late summer of each year. Nomination packets are normally required to be submitted to the AG School at Fort Jackson, SC by February 1st of the following year (see MOI to confirm actual suspense date). Additionally, contact the AG School Operations Division, (803) 751-8300, if you need a copy of the MOI. The Chief of the Adjutant General’s Corps, or his/her Civilian Employee representative, will appoint board members to select the AG Senior Civilian and Civilian Employee of the Year from the nominations received from the field. The Chief of the Corps will notify the winner, the winner’s chain of command, AGCRA, and provide an Army-wide announcement. The winners will be presented the John J. Dinnien Civilian Award for Excellence during the Adjutant General’s Corps National Ball at Columbia, SC. All travel costs for the winner will be borne by the nominating command. The winner’s photo will be displayed at the Adjutant General School and the winner’s name will be added to the AG Corps Senior Civilian and Civilian Employee of the Year plaque hanging in the AG Corps Hall of Honor. Award recipient will be published in “1775″ and on the official AGCRA website. All awards will be recorded by entering the recipient’s name, rank and unit in a database maintained by the AGCRA VP for Awards.